The Hawaiian word puka means hole. Whale biologists use the term puka to describe the large calm, hole on the surface of the ocean created by the vortex as the whales tail is drawn down from just under the surface producing a flat spot in the waves. We positioned the research boat, Deep Blue, over the puka as this was the last know sighting of the singer. I donned my scuba tank and manoeuvred the underwater camera to the dive platform attached to the stern of the boat. Entering the water the heavy camera which requires two people to lift in the air, is instantly weightless as I check the settings. Below the boat the singer could be heard loud and but he was to deep to see. I peer down through the clear cobalt blue and descend toward the noise booming up from the depths. Small Apula fish which usually accompany the humpbacks feeding on their sloughed skin, give me a hint on the direction to swim. I follow the school of Apula as they swim deeper and through the clear water I can clearly see the whale motionless angled at a forty five degree position, tail up. The song is extremely loud now as I approach from behind so as not to disturb his performance. For this kind of close approach I would usually use a closed circuit re-breather as this kind of underwater breathing apparatus is silent and there are no noisy bubbles. 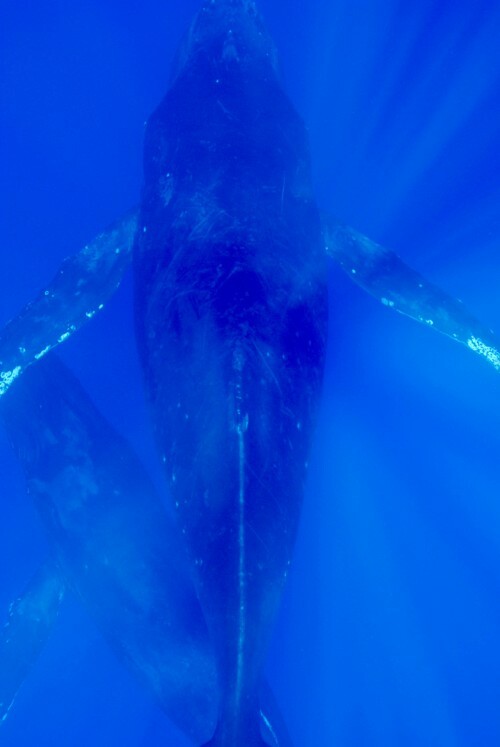 As I was using open circuit scuba I was aware the bubbles would most likely alert the whale of my presence. I knew my time was limited by depth and how long it would take for the whale to notice me. I swam up only a couple of metres from him and focused the HD camera on his big tail. The sound was extraordinary, much like standing next to a speaker at a rock concert. The song seemed to engulf me, I could feel it in the air spaces of my body, shaking the very flesh on my bones. It was me and the whale all alone surrounded by the big blue of the Pacific Ocean…….It some how seemed surreal and I pondered if this was one of the most special events of my life.